As befits one of Brisbane's oldest suburbs, Kangaroo Point has had its own hotel for many, many years. 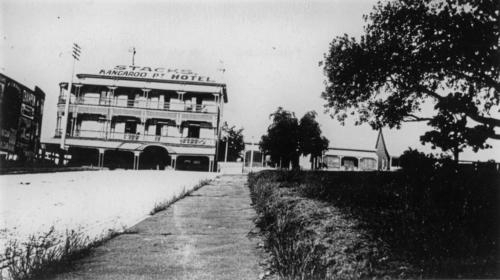 Originally called the Logan Hotel, after a reconstruction in 1886 it became known as the Kangaroo Point Hotel. Then, when the Story Bridge was opened in 1940, it was renamed the Story Bridge Hotel, the name it is still known as today. Here is a photograph of the Kangaroo Point Hotel that was taken in 1915. The family of the current owners purchased the hotel in 1967, and since then it has become a well-recognised, multi-award winning hospitality venue. It was awarded "Best Bar Presentation and Service" at the AHA's recent awards night, having bested such luminaries as the Shangri-La in Sydney and Melbourne's Hilton Hotel. A list of earlier awards can be seen here - not bad for a pub that was once the home patch of wharfies and labourers, and had the reputation as one of the toughest pubs in town. The change has coincided with the trend towards inner-city living and the gentrification of riverside suburbs. The recent photograph shows the current appearance of the hotel with the Story Bridge in the background. Although extensively renovated in 2003, the original appearance of the hotel has been retained. The large number of nearby apartment buildings should ensure that it does not run short of clientele.